Singles Knockout winner - Bernard Vasey. Doubles Knockout winners - Bob Eglon & Norman Brittain. Heaviest Fish in a competition - Paul Kilpatrick - 16 lb 12 oz, 13th December 1989. Heaviest Fish out of competition - John Messenger - 13 lb 00 oz. Open Five - Ian Russell - 49 lb 05 oz. Christmas match winner - Bob Eglon - 16 lb 02 oz - 2 fish. Christmas match Heaviest Fish - Bob Eglon* - 14 lb 00 oz. Heaviest Bag of Fish - Paul Kilpatrick - 28 lb 07 oz - 13th December 1989. *mentioned in I Russell's season summary at foot of page. 1st - Neil Inglis - 31 lb 06 oz. 2nd - Faron Trueman - 6 lb 13 oz. Total weight for the season - 1,920 lb 05 oz. Total Number of fish - 1,001. 27th September 1989 - Brian Harland scorpion fish 1 lb 05 oz. 15th November 1989 - M Kilpatrick Heaviest Fish - 7 lb 08 oz. 26th November 1989 - Dave Cass - Heaviest Fish - 12 lb 01 oz, part of a 22 lb 14 oz bag. 3rd December 1989 - Peter Horbury - Bridlington Sea Birds Open winner. Heaviest Fish - 6 lb 01 oz. 10th December 1989 - Peter Horbury - Cloughton Open. Heaviest Fish match winner - 7 lb 00 oz. (bag of 9 lb 03 oz, 2 fish). 13th January 1990 - Paul Kilpatrick Heaviest Bag of Fish - 28 lb 07 oz and heaviest Fish 16 lb 12 oz. 28th January 1990 - Peter Horbury - Scarborough Rock Anglers Youngers Open. Heaviest Fish match winner - 10 lb 08 oz (bag of 13 lb 04 oz). 14th February 1990 - Bernard Vasey - Heaviest Fish - 10 lb 04 oz. 11th March 1990 - Bass Open. The calm sea and lack of fish over the past few weeks did not affect the entries too badly and in all 114 anglers fished with 23 of these weighing-in a total of about 60 lb. Most competitors returned to the pier Inn for the weigh-in, buffet and prize presentation, where Councillor R Wastell, chairman of Whitby Harbour Committee, presented the trophies and prizes. Overall winner was Keith Thompson, from Morpeth, who caught two codling weighing 7 lb 04 oz and he also won the sweep for the heaviest single fish which weighed 5 lb 09 oz. Second place went to Dave Cass with three codling for 6 lb 02 oz and Denis Thompson was third with five codling weighing 5 lb 05 oz. The sweep for the second heaviest fish went to Arthur McArthy, whose single codling of 5 lb also won him the prize for the heaviest fish caught by a WSAA member. Damien Readman of Cloughton, was the only junior to weigh-in with two codling weighing 3 lb 02 oz and everyone who weighed in received a prize. 21 members entered and only 2 weighed in!! 22 members entered and 6 weighed in. Heaviest Fish match won by Peter Horbury 6 lb 01 oz. 23 members entered and only 3 weighed in!! Heaviest Fish match won by Peter Horbury 7 lb 00 oz. 24 members entered and only 9 weighed in. On Sunday, 95 anglers fished the Whitby Angling Supplies open match and despite poor conditions, there was a good weigh-in with 19 anglers catching a total of 90 lb of fish. The winner of the £100 first prize was Roy Cammish, of Scarborough, with five fish weighing 10 lb 14 oz. The sweep for the heaviest fish went to local angler Dave Cass who caught a 6 lb 11 oz codling. 7 - John Messenger 5 lb 09 oz. Heaviest fish, Dave Cass 6 lb 11 oz, runners up Barry Kendal and Roy Cammish 4 lb 06 oz. No other entries as to how members attended. 13 members entered and only 5 weighed in. 8 members entered and 5 weighed in. 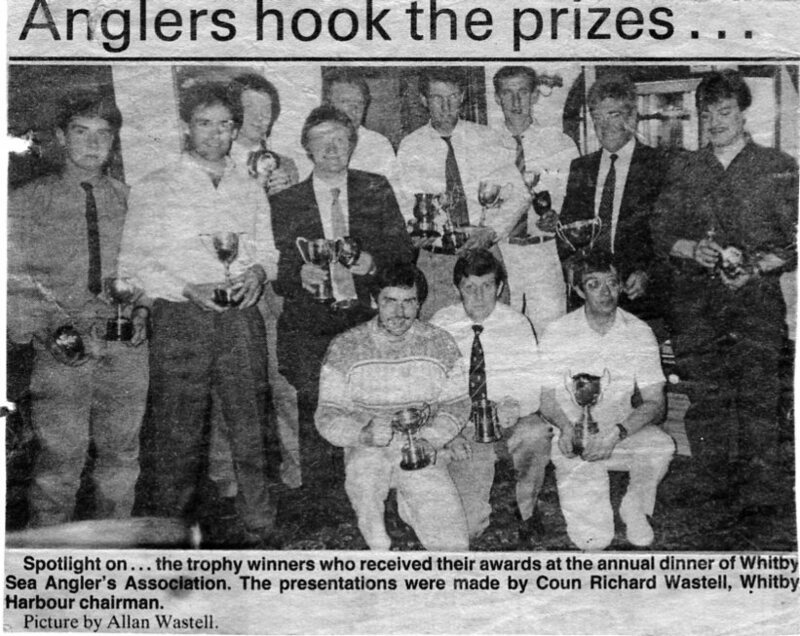 1989 - 1990 Season Trophy winners at annual dinner presentation night, as reported in Whitby Gazette. Photograph by Allan Wastell. Back row: Neil Inglis, Ian Russell, Norman Brittain, William Atkinson, Dave Cass, Paul Kilpatrick, Mike Kilpatrick, Bob Eglon, Dave Perrett. 1989 - 1990 Season Summary. Whitby Sea Anglers Association have just come to the end of another season which started with much promise but tapered away after Christmas when the predominant strong southerly winds produced calm seas which did nit encourage fish to move inshore to feed. In September club members won five out of the nine shore events and also won numerous other prizes at Scarborough Angling Festival. Dave Cass won on a Wednesday, the Yorkshire Codling Championship and the heaviest bag of codling throughout the week. Denis Thompson won on Friday evening match and the Trophy for the greatest weight of fish other than codling but was beaten by just 1 point for the shore angler of the week cup by Ian Russell who also won the Monday and second Saturday events. Whitby Sea Anglers Association own Blue Star Open competition held in November was won by former club member Keith Thompson who now lives in Northumberland and travelled down on the day just to fish the match. Club members Denis Thompson and Dave Cass were second and third. Pete Horbury had a very successful year winning the Bridlington Open and the Cloughton Open heaviest fish matches on consecutive Sundays in December and followed up a month later by winning the Wm. Youngers Open at Scarborough with a 10 lb 08 oz cod. The Cleveland Potash Open held during Christmas week was won for the third year running by Ian Russell and John Messenger won the heaviest fish sweep in this match with his biggest fish to date a 13 lb cod. 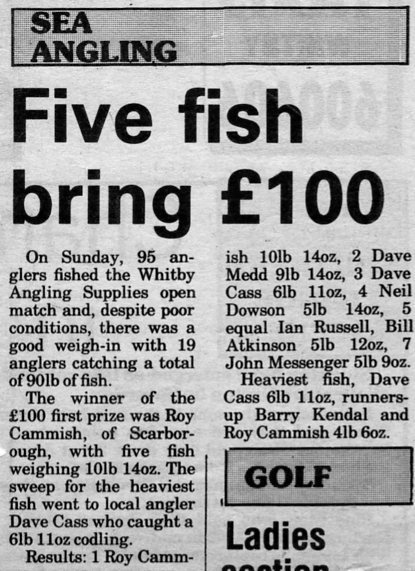 The Whitby Angling Supplies Open in January was won by Roy Cammish of Scarborough and Dave Cass won thee sweep for the heaviest fish with a 6 lb 11 oz cod. Denis Thompson won the final open match of the season, the Bass Open at Scarborough, with a cod of 4 lb 06 oz. In the clubs own matches the overall winner was Paul Kilpatrick who caught a total of 202 lb and also won cups for the heaviest bag of fish (28 lb) and the heaviest fish in a club match with a fine 16 lb 12 oz cod. A number of good cod were landed throughout the season and these included a 14 lb cod which helped win the Christmas competition for Bob Eglon and a 10 lb cod caught by Bernard Vasey to help him beat Paul Kilpatrick in the final of the knockout. Other double figure fish were a 12 lb cod for Dave Cass, a 13 lb cod for Mike Kilpatrick and a 13 lb cod which won John Messenger the tankard for the heaviest fish outside a club match. Neil Inglis won the Junior championship, Bob Eglon and Norman Brittain won the doubles knockout and Ian Russell won the Open Fives Trophy and the cup for the greatest number of fish (101). Last edit 24th February 2014, 15th March 2014.